In Iowa, pork tenderloins are usually a sandwich, breaded and deep-fried, with the pork extending far beyond the confines of the bun. You can usually get grilled tenderloin sandwiches too, which are simply grilled. 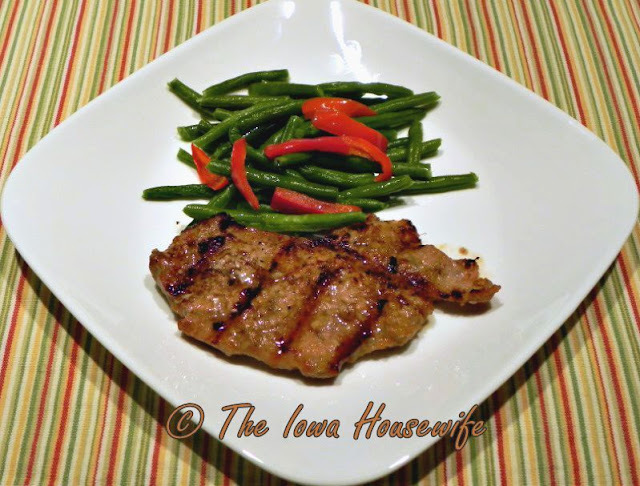 My husband’s brother, Don, gave us some tenderized pork steaks or cutlets from their homestead hog, and we couldn’t wait to grill them in one of our favorite marinades. If you don’t marinate them, they can be dry and somewhat tasteless. Don’t overcook these little cutlets, it takes really just a few minutes. We enjoyed them today with some garden green beans and red peppers, and fruit for dessert. I served them last week to guests with Orange Fruit Salad and homemade Garlic Parmesan Rolls and Molasses Baked Beans. Remove tenderloins from marinade; discarding marinade. Grill tenderloins over medium-hot coals, turning occasionally, 4-6 minutes total, depending on thickness.